← Do You Have “An Inordinate Fondness”? 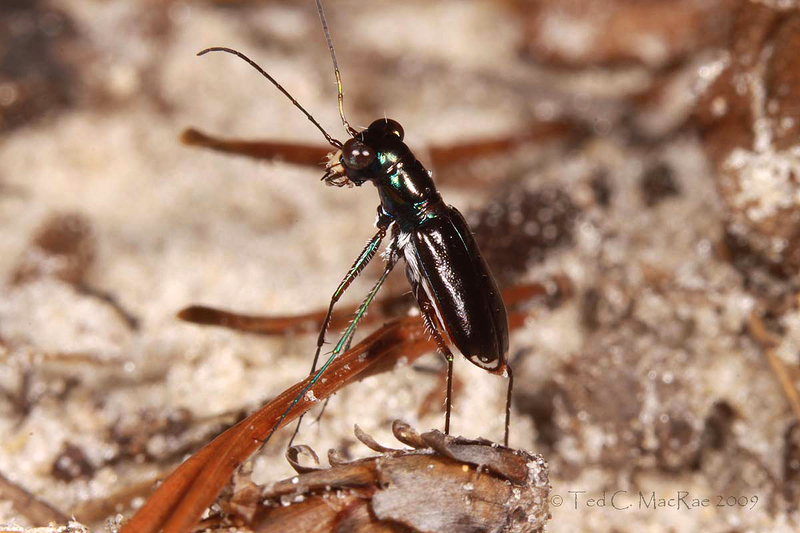 Florida is known for its rich assemblage of tiger beetles—27 species in all, including four endemics (Choate 2003). However, late summer is generally considered not the best time of year for seeing this diversity, since adult populations of most species begin to wane as the intensity of the summer heat reaches its peak. I knew the timing of my family vacation in early August might be a bit off; however, considering I had never looked for tiger beetles in Florida before, I remained optimistic that I still might encounter some interesting species. My optimism was quickly rewarded—in one afternoon of exploring the small coastal preserve just outside the back door of my sister-in-law’s condo, I found Ellipsoptera marginata (Margined Tiger Beetle), its sibling species E. hamata lacerata (Gulf Beach Tiger Beetle), and several 3rd-instar larvae in their burrows that proved to be the Florida endemic Tetracha floridana (Florida Metallic Tiger Beetle). Good fortune would continue when I made a one-day trip to the interior highlands in a successful bid to find Florida’s rarest endemic, Cicindela highlandensis (Highlands Tiger Beetle), finding also as a bonus the splendidly camouflaged and also endemic Ellipsoptera hirtilabris (Moustached Tiger Beetle). Five species, including three endemics, in just over a day of searching! I had one more day to sneak off and do what I love most, and I wanted to make the most of it. Among the suggestions given to me by my colleagues, the most promising-sounding was the “end of the road,” a Gulf Coast salt marsh near Steinhatchee in Dixie County where I was told as many as 6-10 species of tiger beetles could be seen at once. I didn’t know it at the time, but this particular location has achieved legendary status among tiger beetle enthusiasts (Doug Taron recently wrote about his experience, calling it the Road to Nowhere). A 200+ mile drive from my base near St. Petersburg, it would take the better part of 5 hours to drive there, and not wanting to put all of my eggs in one basket, I looked for potential stops along the way. About midway along the drive was Withlacoochee State Forest, where one of my colleagues had told me I might still find the fairly widespread Cicindela abdominalis (Eastern Pinebarrens Tiger Beetle) and its close relative, C. scabrosa (Scabrous Tiger Beetle)—the fourth Florida endemic. My plan was to leave early in the morning and spend a few hours at Withlacoochee before driving the rest of the way to finish out the day at Steinhatchee. It took some time to find my bearings upon arriving, but after some discussion with the decidedly forestry-oriented staff at the headquarters, it seemed that the Citrus Tract was where I wanted to be. I was looking for the sand barren and pine sandhill habitats that these species require, and the staff’s description of the northern edge of the tract as having lots of sand and “not very good for growing trees” suggested this might be the place. 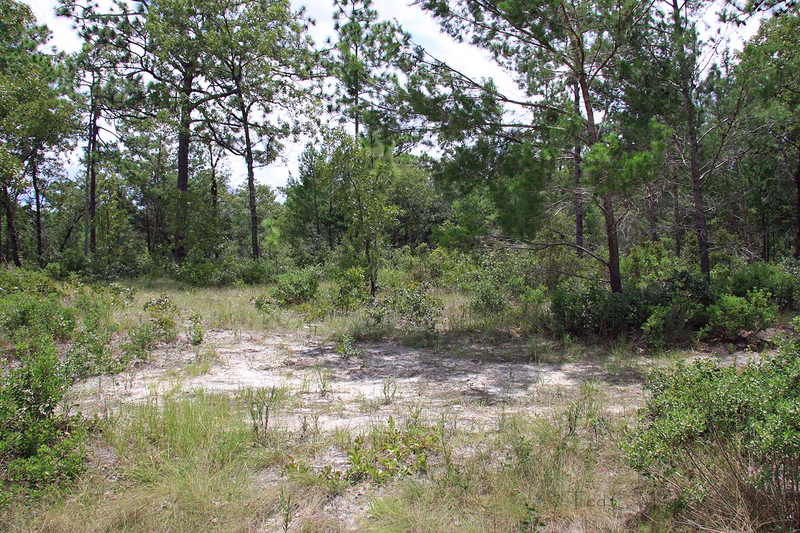 Pine sandhill (also called “high pine”) is a pyrophytic (fire-dependent) plant community characterized by sandy, well-drained soils, a widely-spaced longleaf pine (Pinus palustris) and turkey oak (Quercus laevis) canopy, and an herbaceous layer dominated by wiregrass (Aristida stricta). I quickly found such habitat in the area suggested, and it wasn’t long before I found the first of the two species—C. abdominalis—rather commonly along a sandy 2-track leading through the area. For those of you who see a distinct resemblance of this species to the rare C. highlandensis that I highlighted from my trip to the central highlands, this is no coincidence. Cicindela abdominalis is very closely related to that species, the latter distinquished by an absence of flattened, white setae on the sides of the prothorax and the abdomen and by the highly reduced or absent elytral maculations (Choate 1984). Dense white setae and distinct apical elytral maculations are clearly visible in the individuals shown in these photographs. It was a blistering hot day (just as every other day on the trip had been so far), and it wasn’t only me who felt that way. Tiger beetles, of course, are ectothermic and rely upon their environment for their body temperature. Despite this, they are able to regulate body temperatures to some degree by using a range of behavioral adaptations intended to mitigate the effects of high surface temperatures and intense sunlight. The photos above show one of these behaviors, known as stilting. 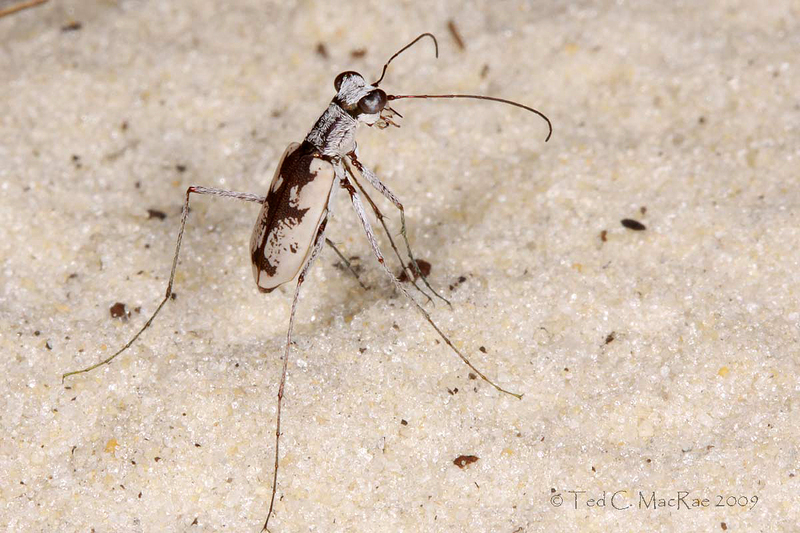 In this behavior, the adult stands tall on its long legs to elevate its body above the thin layer of hotter air right next to the soil surface and as far off the sand as possible (Pearson et al. 2006). As the heat of the day intensifies and the zone of hot air at the soil surface broadens, stilting alone may be insufficient to prevent overheating. When this happens, the beetles combine stilting with sun-facing, a behavior in which the front part of the body is elevated with the head oriented towards the sun. This position exposes only the front of the head to the sun’s direct rays, thus minimizing the body surface area exposed to incident radiation. I was also fortunate to have another chance at photographing the beautiful and marvelously-camouflaged Ellipsoptera hirtilabris (Moustached Tiger Beetle), which, in similar fashion to C. highlandensis, I found co-occurring with C. abdominalis in rather low numbers. As before, they were extremely wary and difficult to approach, especially in the extreme heat of the day, and all of my best efforts to get a good shot of the species in its “classic” pose were frustrated. The photo above was about as close as I could get to any of these beetles when they were out in the open before they would flee; however, it nicely demonstrates the use of stilting combined with sun-facing during the hottest part of the day. "Shade seeking" is another behavioral response to intense heat. Another behavioral response to extreme heat is shade-seeking—adults may either remain active, shuttling in and out of shaded areas, or avoid exposed areas altogether and become inactive. One thermoregulatory behavior for extreme heat that I did not observe was daytime-burrowing, in which adults construct temporary shallow burrows during the hottest hours of the day. Although I did not observe this behavior by either species at Withlacoochee, I have seen it commonly among several species in sandy habitats here in Missouri and in the Sandhills of Nebraska (e.g., Cicindela formosa, Cicindela limbata, Cicindela repanda, Cicindela scutellaris, Cicindela tranquebarica, Ellipsoptera lepida). Photo Details: Canon EOS 50D, ISO 100. Habitat: Canon 17-85mm zoom lens (landscape, 17mm), 1/100 sec, f/10, natural light. Insects: Canon 100mm macro lens (manual), 1/250 sec, f/16–18 (C. abdominalis) or f/20–22 (E. hirtilabris), MT-24EX flash w/ Sto-Fen diffusers. This entry was posted in Cicindelidae, Coleoptera and tagged beetles, behavior, entomology, Florida, forest, insects, landscapes, nature, science, taxonomy, tiger beetles. Bookmark the permalink. 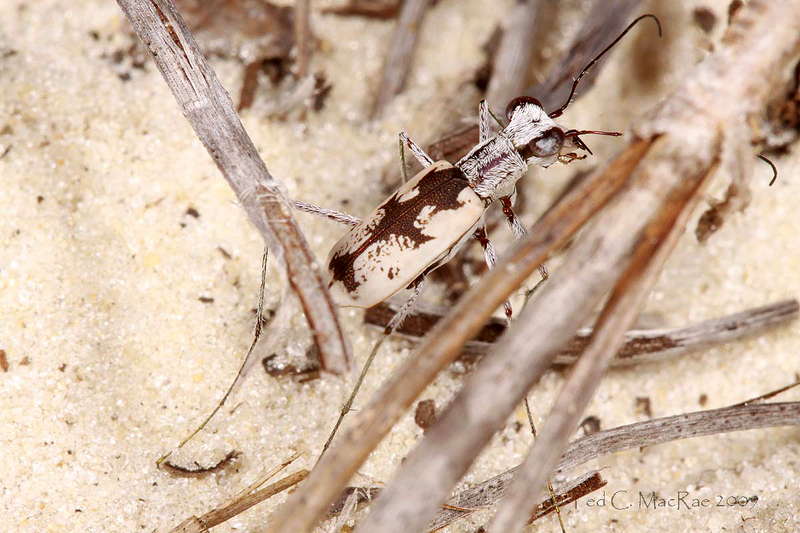 17 Responses to Tiger Beetles Agree—It’s Hot in Florida! Your experience was way better than mine. I think I was too late in the year and only got to see two species. OTOH, one of them was Cicindela scutellaris unicolor, which was a new subspecies for me. I’m very impressed that you got such nice photos in conditions that were as hot as you are describing. That tends to make them very active and skittish. Yes, Florida has a preponderance of summer species, so fall is pretty lean there. At least you got C. scutellaris unicolor – I haven’t run across that one yet. I had intended to take a different angle on this post until I sat down to write it and noticed that all of my photos from the day were demonstrating different thermoregulatory behaviors. My first experience “bug hunting” in Florida was last April in St. Augustine. I cannot say my experience was nearly as exciting or produced as many wonderful species as yours. I was exploring along the sand dunes, when I placed my foot square in the center of a fire ant mound….OUCH! We took a hike through a nature reserve and I spotted a Zebra Longwing, which was almost as exciting as the Osprey we spotted sitting on a nest. Your beetle photos are superb. Tiger Beetles are truly wonderful subjects to photograph, and you are mastering the skill required to capture them in all their beauty. I can hardly wait until warm weather, to grab my camera and head back outside and capture more images myself. Winter is a true test to my patience. Yep, fire ants were an early lesson during my first ever bug collecting trip in Florida. These days whenever I run across them, I’m content to kick their mounds and get them all boiling mad so I can watch for a bit. Thank you for your kind comments – they are much appreciated. I’m having fun with the camera, but I’m also becoming my own worst critic. I don’t suppose one ever becomes completely satisfied with their own photos. This is very educational, Ted. I’m impressed the heat meant you could capture shots of so many of the behaviors they use to cool off. And great shots they are! Especially the mustached variety which just seems so mesmerizing to me. I appreciate that you’re willing to sweat and suffer like this–especially on your vacation. That’s real passion. People acclimatize to the heat to some extent when they live in it, so I think some of us who live in the South forget how miserable it can be for visitors (we forget mainly because we’re too busy complaining about it ourselves!). Hi Jason. It gets quite hot here in Missouri as well, but it was definitely of a different magnitude in Florida. I’ve never really had problems handling the heat – partly due to being acclimated with regular time in the field, partly due to bullheadedness about wanting to “win” against any challenges. I suffered a case of heat exhaustion in ’08 ( during a bike race), and since then I’ve seemed to have much more trouble handling the heat. If I wasn’t so bullheaded, I wouldn’t have these pictures to show. Ellipsoptera hirtilabris is certainly among the most striking tiger beetles I’ve ever seen – seeing so few of them made it even more special for the ones that I did see. I always learn so much from your posts, and your photos are incredible. You “do” macro photography, right? Have to get really close? I haven’t seen the movie, “District 9,” but I think the makers of the movie must have based the alien creatures on these tiger beetles and their mouth parts! Yes, ma’am – real macro, subject distance only a few inches for these shots. Thank you for the nice comment. I hadn’t heard of District 9, but I just looked at the trailer and it looks like a great movie (I’m rather nuts about alien-based sci-fi movies). The clearest case of a movie alien based on a real insect is the ‘Ceti eel’ in Star Trek: The Wrath of Khan, clearly modeled after the otherwordly-looking doodlebug, or antlion larva. Wow Ted, what a fascinating article you wrote concerning your adventure, and I love your photographs! What kind of a lens did you use to photograph the tiger beetles above? Tiger beetles are also found up here in Alberta, Canada. John Acorn, an Alberta scientist, has even written a book about them. It is fascinating how adaptive tiger beetles are, how they can live in places like Florida but also in climates such as Alberta’s where winters can be very long and very cold. We have 19 species of tiger beetles in Alberta. Apparently there are 115 species of tiger beetles which live throughout North America. 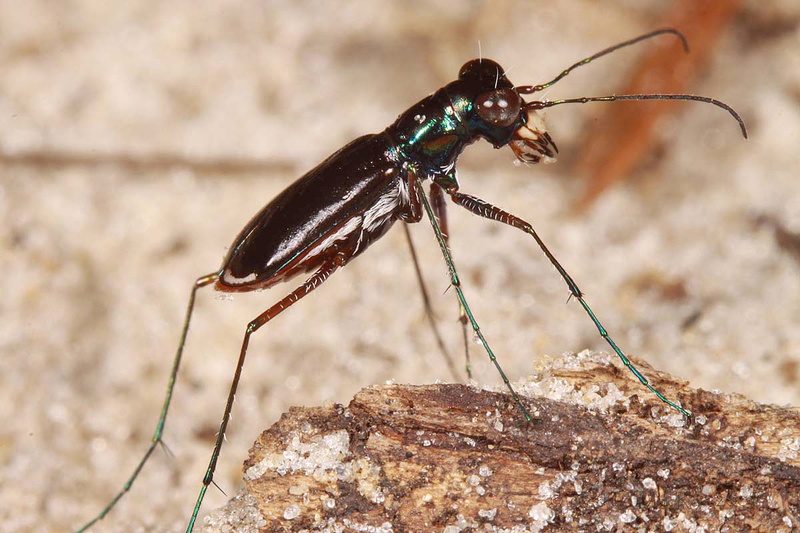 Some of your readers may not know that some tiger beetles can run at a speed of 8 km/h (5 mph). For its size it has been suggested that they are technically the fastest running land animals. I wish you and those close to you as well as your readers a very festive holiday season and all the best in 2010! Thank you, Wayne. I used a Canon 100mm macro for these shots. I also have Canon’s 65mm MP-E 1-5x macro that I use sometimes for closer shots and smaller species. The fascination of tiger beetles is far greater than would be expected by their species diversity alone – many other beetle groups exhibit far greater numbers. However, few can match tigers for their geographical variability, penchant for extreme habitats, and behavioral charisma. Gotta luv ’em! p.s. Love the insect quotes on your site. Whenever I see tiger beetles, I always remember how prized a tiger beetle was a a specimen for an insect collection in various taxonomy classes. Tiger beetles are so very fast and hard to catch, only a few people managed it. For you to capture such amazing photographs in the conditions you must have been working under is beyond admirable. Kudos! Hi Roberta – thanks! It’s a challenge getting photos like this, but that’s part of the fun.